I haven’t posted anything new on this page for a while, but if you’re looking for recipe ideas, I would highly recommend taking a look at the Stonewall Kitchen website for ideas from their cooking school course schedule. I’ve found a ton of great ideas from many regions in the world, with a variety of seafood, beef and chicken recipes that won’t let you down. Another great place to find outstanding recipes (quickly – with photos) is Pinterest…. 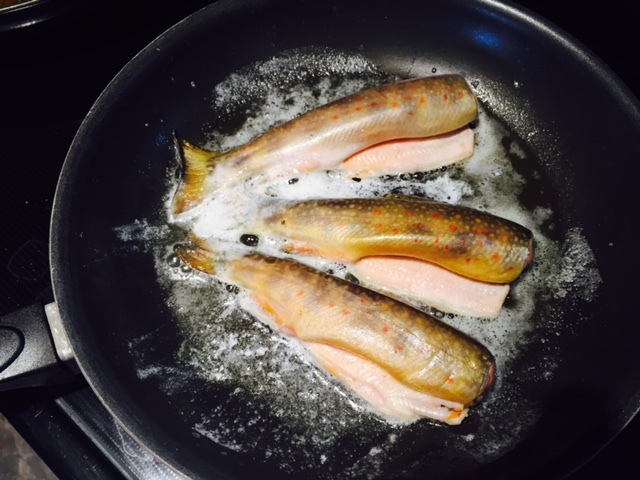 Brook Trout in Butter! It doesn’t get simpler than this. My favorite memory of cooking trout was riverside with my good friend Travis Keltner. We were fishing a river off of Moosehead Lake (the East Outlet) and I brought my cooking gear from camping. Nothing like fresh fish. 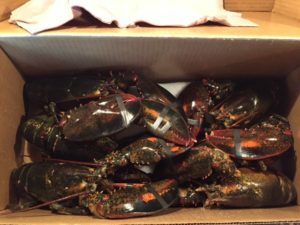 It was easy – butter, high heat, some salt and pepper and a little lemon if you have it! oil. 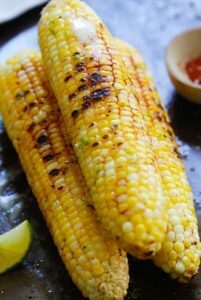 I love to cook corn on the grill, but remember to turn it on a regular basis. Sprinkle the lime zest over the corn when you are serving it. Summer in New England! It’s that time of year again…. for Lobsters! So many ways to cook it! I like the traditional way, but if you’re having a fancy dinner, try grilled lobster tails drenched in Sriracha Butter! 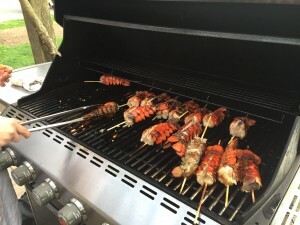 This recipe is from the “Pairing Beer and BBQ” event that I hosted at Stonewall Kitchen. Chef Bethany Taylor created the menu and it was fantastic! I would recommend putting a wooden skewer through the tail before you grill it, that will prevent the tail from curling up!